This site is dedicated to both the Air and Ground Crews of the 482nd Bomb Group, 813th Bomb Squadron, and B-17 #25731 piloted by Lt. Bill Owen, who against all odds were credited with being the first American B-17 Bomber to release their bombs on the German capital of Berlin on March 4,1944. The remarkable true story of the 8th Army Air Force "Pathfinders"
The 482nd Bomb Group was the only U.S. 8th Army Air Force Bomb Group formed outside of the United States during WWII. The Bomb group was formed to develop, train, and deploy the Top Secret Radar Platforms of "BTO" (Bomb Through Overcast) during the Strategic Bombing campaign against Nazi Germany. The 482nd primarily utilized two distinct operational radars code named H2S "Stinky" and H2X "Mickey". 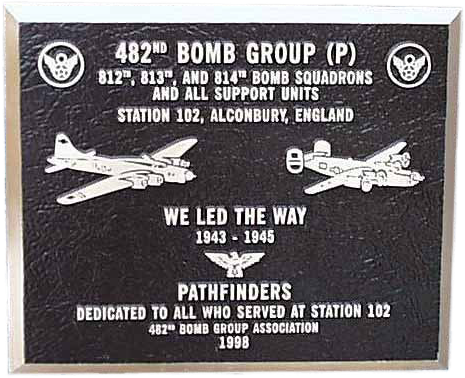 The first B-17 to release its bombs on Nazi Berlin belonged to the 482nd Bomb Group. It was one of the only Bomb Groups to fly both major U.S. Bombers of WWII the B-17 and B-24 in its three operational bomb squadrons. "In leading the greatest aerial warfare in history throughout the fall, winter and spring of 1943-1944 against the Hun's capacity to produce the aircraft and other vitally needed implements of war, many of our gallant 482nd officers and men have given their lives. They were among those who kept the attack going relentlessly and at ever increasing pace despite severe weather, the need for improvisation under trying conditions, and determined enemy opposition, reducing the enemy's capacity to resist at a time when he had every expectation of increasing his strength. Their work proved the feasibility of the new Radar technique of attack and helped develop this technique so that all Bomb Groups could finally be trained and fitted to use it. Truly, their work lives on.